Woohoo! We just booked ski lessons for our first ECS skiing trip in France in December: 2.5 hours in the morning & 2 hours in the afternoon per person with Ian McKellar and Laurent Calvet of Avoriaz Alpine Ski School. Ian has 33 seasons teaching experience in the Alps, 27 of them in the Portes du Soleil. Ian represented Britain at world cup level in moguls and was an examiner for the British Association of Snowsport Instructors. Laurent was one of the original snowboarders in Avoriaz over 22 years ago and is a real hot shot on board and skis. 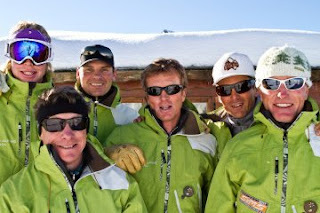 See http://www.avoriazalpineskischool.com/meet-the-team.html for further details. A first class chalet with first class skiing lessons! Can't wait!